Thank you for your interest in presenting a program at Cary Memorial Library! In an effort to support community interests and showcase local talents, the Library welcomes applications from members of the public interested in presenting programs at Cary Library. I am not a presenter, but want to see a program on this topic at the library. Tell your reader what they will see, hear, or do at the program and why they would want to attend. Describe your program in one or two paragraphs. 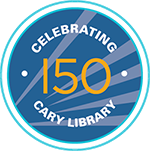 The Cary Library’s Mission is to ignite curiosity, engage minds, and connect our community. until I consult with library staff.